Luce features a distinctive forward-leaning seat that absorbs impact as you sit down, while its innovative seat cradle design provides extra support. Developed by Okamura in collaboration with a company that specializes in robot technology, Luce has minimal dials that offer multiple areas of adjustment. Self-adjusting reclining tension and high-density mesh provide firm support for your lumbar area. 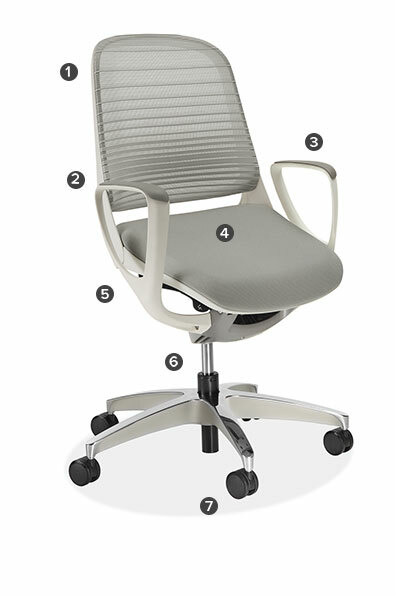 This chair offers reclining capabilities that reduce stress on your back and encourage movement throughout your workday. This chair features a high-density mesh back that provides firm support for the lumbar area. Its lumbar support feature mimics the natural curve of your spine to provide the greatest amount of lower back support when seated, which is important if the chair is used frequently or as a primary task chair. Armrests offer extra support throughout the workday to reduce strain on your upper arms and neck. Fixed armrests complement this chair’s design and provide the right amount of support. This chair’s multi-density foam seat cushion is softer in front and firmer in back to minimize pressure on your thighs and knees to ensure lasting comfort and proper circulation in your legs. Additionally, this chair has a distinctive forward-leaning seat that absorbs impact as you sit and features an innovative seat cradle to provide extra support, making it a great option for multiple users. Self-adjusting tension control automatically regulates the effort required to recline. This is an especially helpful feature if the chair will be used by multiple people, as it automatically adjusts to accommodate personal preferences.